We’re Winning in Afghanistan: Why hasn’t the media noticed? ….We are reaching the point in which the misperception being created by the media is undermining our ability to achieve their own definition of success in Afghanistan: denying al Qaeda a safe haven via a strengthened Afghan security force that is capable of taking over lead responsibility in the future. Have insider attacks and sensational Taliban attacks taken place? Yes, and we are accountable for that. But there is something to the comments made by senior officials that the sensational attacks are reflective of a desperate insurgency. If you were a Taliban commander losing an insurgency for the past couple of years since the surge, wouldn’t you feel the need to conduct sensational attacks to give the perception your narrative is winning out and to reassure your followers? The results of the surge — specifically, the growth of the Afghanistan National Security Forces (ANSF) in both size and capabilities — has made it possible for the coalition to transition to what we call a Security Force Assistance mode of operations….Should Afghans see confidence and esprit de corps in the ANSF, we could see something similar to the “Anbar Awakening” in Iraq. That confidence is starting to build….This past week all of the casualties for our area of operations were members of the ANSF. Don’t underestimate ANSF’s bravery or their willingness to put their lives on the line for their country because they are doing it every single day. They are not afraid of the Taliban, and they move quickly to the sound of the gun. I don’t know how things are really going in Afghanistan. Hell, maybe Upton is right. And the truth is that I’m willing to let them stick to their current 2014 timetable. It’s probably the best chance we have of a non-catastrophic endgame. 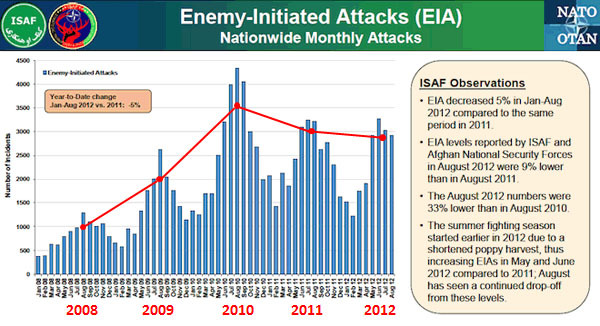 Nonetheless, Upton’s happy talk rings pretty hollow when ISAF’s own figures show that Taliban attacks remain at far higher levels than they were in 2008 and 2009, before the surge started. I don’t see a lot of reason for optimism in the chart below.